No pricing details have yet emerged for the bike but it is speculated that this will be the most expensive bike from Royal Enfield till date. Royal Enfield is expected to display the upcoming Royal Enfield Interceptor 750 at the 2017 EICMA show on 7 November. 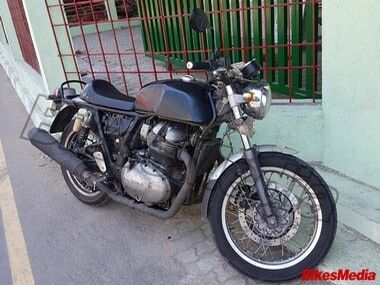 Interceptor 750 is known as Royal Enfield Continental GT 750 as reported by Overdrive. The bike will first be unveiled in Europe and then make its way across the globe. The report points that potential customers can look forward to the launch of the bike sometime early next year. The report further states that this is Royal Enfield's first 750cc fuel-injected engine with air-cooled parallel twin-cylinders alongside it. The bike is also expected to come with a bigger frame than the current Continental GT535. In addition to the frame, the engine of 750 is rumoured to generate more than 50 PS horsepower. The bike is likely to sport a single disk brake on the front and on its rear wheels.